But let me ask you this; why do you put down lots of money for detailed models? Well, I guess you want to look at them no? 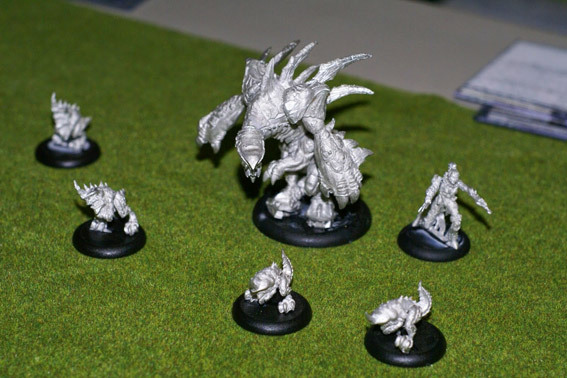 Or you could simply use cheap counters or pawns to represent your models if you didn’t. Why take the time to paint them? So that they’re even better to look at. Bit silly to come at it from this angle but all I mean is that war-gaming is about spectating first and foremost. There’s nothing more satisfying then seeing two nicely painted forces duke it out on the table. Win or loose it is a beautiful spectacle to follow and observe. Can you honestly say that some bare metal models on an empty green field gets the imagination going? Even if you’re in this hobby purely for the tactical challenge you’re still looking at miniatures a lot. If miniatures are purely game-pieces to you and you don’t want to invest time in them then you’re probably better of seeking another hobby. Most wargamers will agree with this. 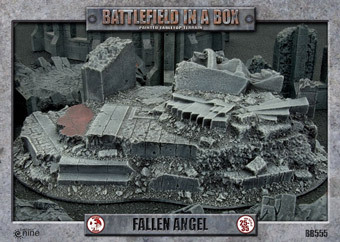 But while this generally counts for the models it’s much less so for the gaming tables those miniatures are placed upon. Bit strange don’t you think? IF this is a social spectating hobby then the area that tells the story alongside the models should be just as important shouldn’t it? In my humble opinion the gaming table and the terrain placed on it deserve as much attention as the models. 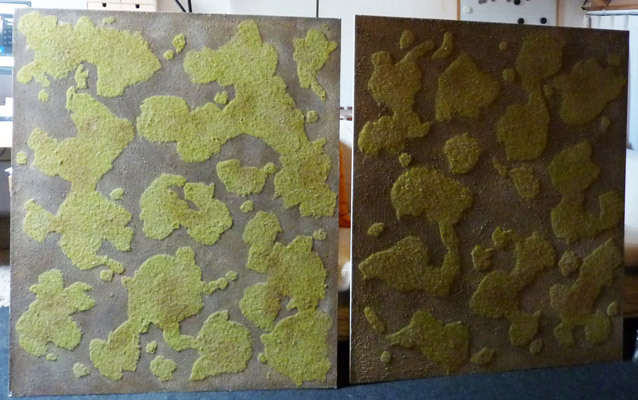 making your own high quality terrain from scratch is a laborious endeavor indeed. The models are already expensive AND time-consuming to paint so this is a huge detriment for most gamers to invest in terrain. Not to mention the practical limitations of transporting terrain if you don’t have the luxury to have your own gaming room. Most wargamers will find a place to game at a store or club anyway. But even then I’d advise in investing some of your hobby-time in terrain if you can. At the very least you’ll have a new perspective on how terrain affects your games. In my gaming group I’ve found myself being the “terrain guy” most of the time. This is because of my art background. I’m often more comfortable scratch building with all kinds of materials then most of my gaming buddies. And after quite some years in this hobby I’m fortunate to own a sizable collection of terrain. 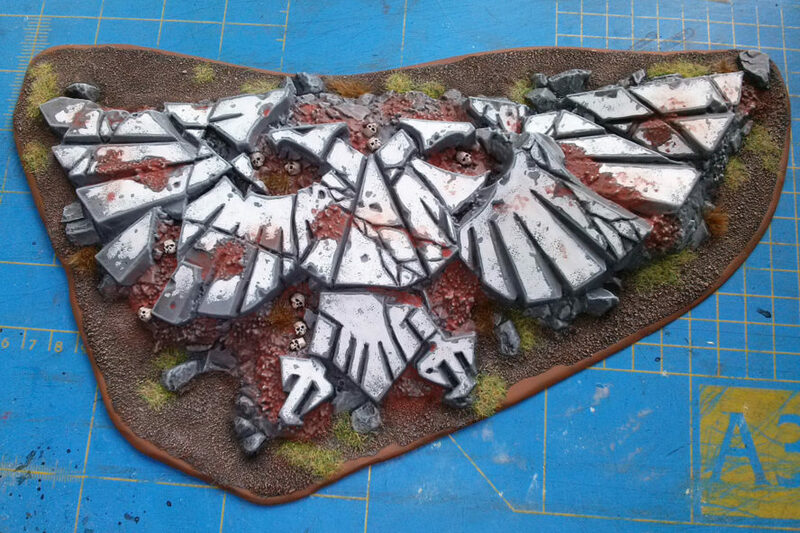 Enough to comfortable fill a fantasy table with some variation and almost enough to do the same for a sci-fi table. 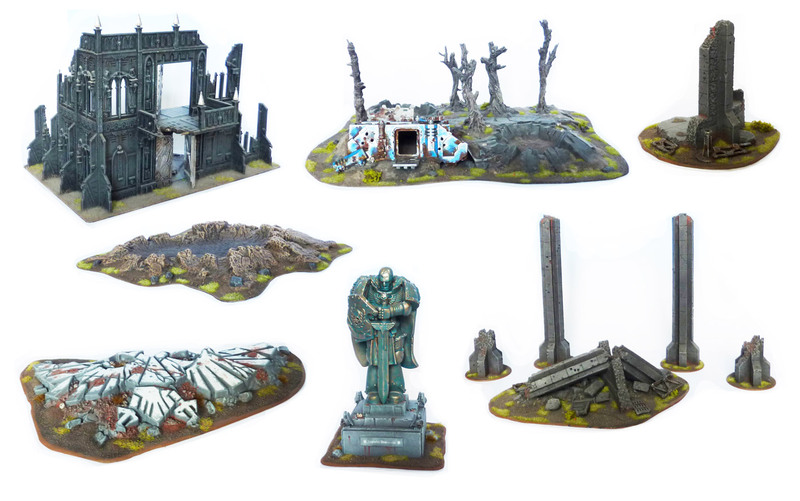 And a selection of my sci-fi terrain. I’ve also made my own two-part table with sand and grass. With a painting on the other side so they could be hung on the wall as decoration without taking up too much space. Art background coming to the rescue again! But the big question is; should I scrape enough money together and buy all my terrain or take the time and scratch-build it all? I’ve found that the sweet spot is somewhere in the middle. Meaning you try to look for cheap options to buy the basic terrain features that are very hard or way too time-consuming to make yourself. For example big trees and detailed buildings. And try to add to these big eye-catchers with self made details and fillers. It’s also advisable to add and elaborate on the bought pieces to make them fit your scratch build scenery and match the table. This doesn’t have to be very elaborate but some extra basing and painting can go a long way in making those big cheap pieces look a whole lot better. The time invested is worth it many times over and it’s still much less time-consuming then scratch building it entirely. Luckily there are many companies out there that sell good quality terrain for a decent prize. I can personally recommend GaleForce 9 for their high quality and durable terrain that’s very affordable. I’ve several of their kits and have never been disappointed yet. Also, while Games Workshop is generally very expensive, they surprisingly have a few decently priced plastic terrain kits that are well worth it in my opinion. There’s always something to add or upgrade. But I’ve given myself the goal to be able to fill a large fantasy table and Sci-fi table comfortably with some variation between games. For Warmachine I can easily mix and match to fit the steam-punk vibe. And while I’ve basically got enough and only have a few unpainted terrain pieces to finish it’s still a good time to give everything a proper run through and fix any damage on the older pieces. A good coat of varnish here and there wouldn’t hurt either. Enough material for future projects and blogs to keep me busy. Now, where did I leave those beer cans?